Life's perfect, until Liesel delivers her ultimatum: if he won't agree to start a family, she'll have to leave. He can't bear to lose her, but how can he face the prospect of fatherhood when he has no idea what being a father means? If he could somehow make her stay, he wouldn't have to choose ... and it would be a shame not to make use of the cellar. Underneath is the second novel from author Anne Goodwin, following the success of her debut Sugar and Snails in 2015, (critically acclaimed and shortlisted for the Polari Prize) . A dark and disturbing tale of a man who appears ordinary on the surface, but is deeply damaged. 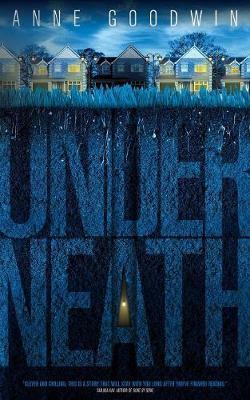 Clever and chilling; [Underneath] is a story that will stay with you long after you've finished reading. [Underneath] is a compelling, insightful and brave novel of doomed, twisted romance driven by a sustained and unsettling voice. This secret tantalisingly grips the reader, gradually being pieced together bit by bit, so intrinsically and poignantly mapped out that I truly cannot praise this novel highly enough. Fiction delivered by a writer who knows not only how to craft her words but also what those words should be communicating. A probing debut novel and, like its protagonist, not what it first seems. I loved this book. Sugar and Snails is beautifully written and a truly impressive debut by Anne Goodwin. It reminded me a little of Claire Messud's The Woman Upstairs. The character of Di, at first frustrating, grows more endearing as you begin to understand her. Her friend Venus and lover Simon are well-drawn; there as foils to Di's story. A beautiful and gripping read. Sugar and Snails is a brave and bold emotional roller-coaster of a read. Anne Goodwin's prose is at once sensitive, invigorating and inspired. I was hooked from the start and in bits by the end. Very much to be recommended. A very moving portrayal of how paralyzing the shame of one's identity can lead to lifelong isolation and secrecy. A gripping, compelling and moving read.